Famous for: Experience seekers, tourism, photography and nature lovers. Entrance Fee: For adults, the entry fee is 30 INR per head and for children below the age of 10 years, the fee is 15 INR. Children below the age of 5 years have no entry fee. Visiting Time: Government Rose Garden in Ooty is open on all days of the week and the timings are from 9 A.M. to 6 P.M.
Visit Duration: 3 hours. You can also stay longer to enjoy the place thoroughly. Located in Vijaynagaram, the Government Rose Garden is one of the most famous tourist spots in the state of Tamil Nadu. It was built back in 1995 and maintained wonderfully since then. The place is perched on the slopes of the Elk hills and is ideal if you are looking to spend some quality time with your family and friends. Read the article to know detailed information about this spot. You are not supposed to touch the flowers or any plants. They are very carefully maintained. The parking charges are separate in the Government Rose Garden. Make the necessary arrangements if you are travelling by car. If you are willing to carry your camera or video camera, you will have to purchase a separate ticket for both. Wear comfortable clothes and shoes to enjoy the most in this place. You might want to carry a light shawl in case you feel chilly during the winter season. If you are waiting to unleash your camera skills, this might be the perfect place. Click amazing pictures of the scenic beauty and make memories for a lifetime. Walking through the park as you look at the lovely roses will leave you awestruck. In the surrounding area, there are some amazing restaurants that serve authentic Indian food. The variety is endless and get ready to taste some of the best dishes available down South. You will need no guides to take you through this picturesque place. The roses are arranged in a perfect way and are pretty self-explanatory. Located at the heart of the city, Government Rose Garden can be easily reached via an auto or cab from anywhere in the city itself. From Rajiv Gandhi Chowk, it is 11 mins away (2.7 km). The best time to visit Ooty is during the months of March and June. You can make the most of your time here because of the pleasant weather conditions and amazing atmosphere. The temperature is not above 20 degrees Celsius and is very well suited for tourists. Sight-seeing is also a major reason why we suggest this time of the year. The greenery around will make you fall in love with Ooty. 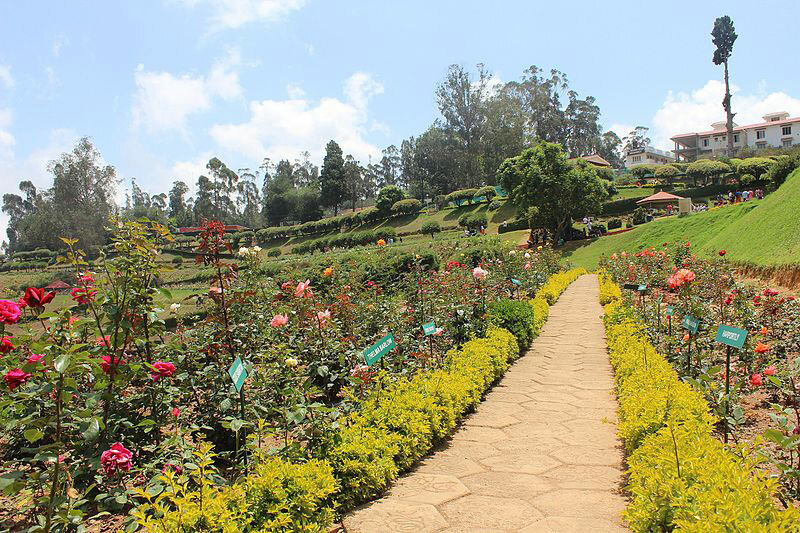 The Government Rose garden in Ooty is considered as one of the most famous in the country for its myriad display of roses. The categories of roses exceed more than 20,000 and include Polyanthas, Papagena, Yakimour, Floribunda and Hybrid Tea Roses. Unusual colours of roses like black and green can also be observed. These rose varities have been collected from different parts of the world. There is also a beautiful statue of an angel in the rose garden. 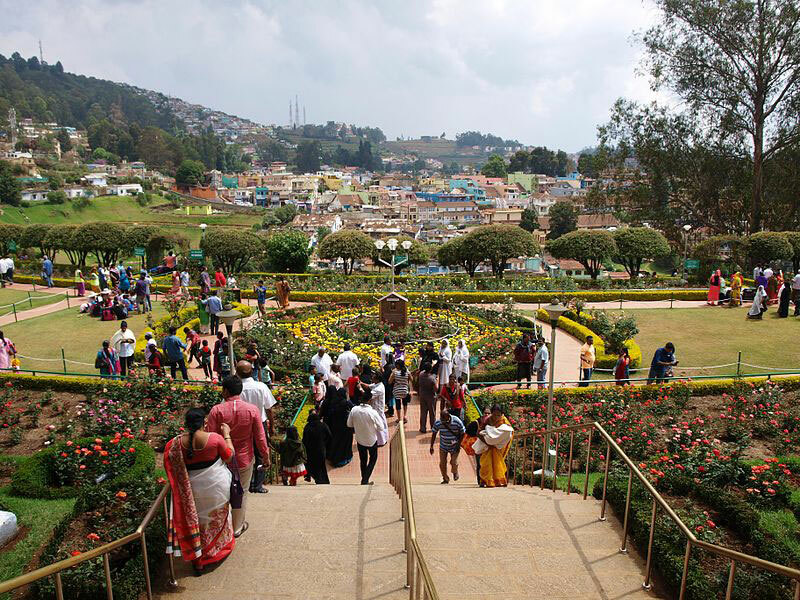 There is a point in the government Rose Garden in Ooty known as the Nila Madaam from where you can get a spectacular view of the entire place. Maintained by the Horticulture Department of Tamil Nadu, this place has received the very renowned Garden of Excellence award back in 2006. If you are planning to visit Ooty anytime in the future, missing out on this place will be a huge miss. Tourists and visitors make it a point to spend some time in this mesmerizing place. This place is especially recommended for flora and nature lovers who would find a visit here to be extremely fulfilling.